Monday again eh? There is however good news, I think the closer we get to Christmas the easier they'll become. I actually say this with a certain amount of smugness as I've just booked my remaining holiday days for the year and as I had some spare days I've decided to take two Mondays in December off. I'm planning on spending them Christmas shopping, wrapping up gifts and generally absorbing myself in festiveness. I am one of these people who LOVE Christmas! Especially the build up .. the Christmas Adverts (if you're wondering I'm not really that fussed by the John Lewis ad and my favourite is the M&S), festive sandwiches, pretty lights and Christmas Markets. 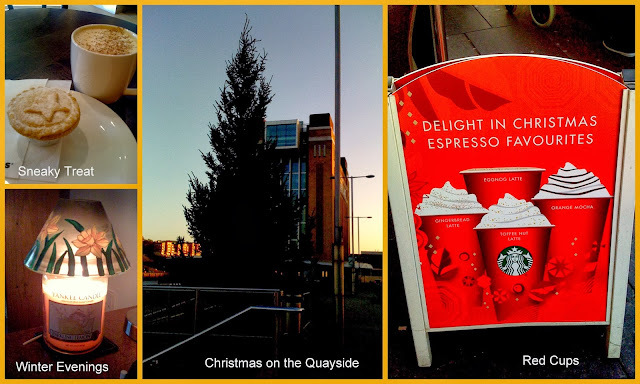 One of the best parts about Christmas is the promotions they have in rival coffee chains Costa and Starbucks. Now usually I'm a Costa girl but this year I think Starbucks have triumphed. I was already a huge fan of their eggnog latte (to the point where I have to limit myself to one a week or I'd happily have one every day) but this year they also have the tastiest mince pies with gorgeous thick sweet pastry mmmmmmmmmm, a chocolate orange mocha that put's the Costa version to shame and the gorgeous signature hot chocolate with caramel. I now have to walk past these temptations every day with the newly opened Starbucks on the Quayside. It's my first year seeing the Christmas build up in Newcastle and I was so excited on my walk to work last week when I spotted the Christmas tree had gone up outside the Baltic. I think the lights should be going up on Thursday and then the walk home after work really will be magical. It's beginning to get so cold as well, our little flat is pretty chilly in the evenings so my Yankee Candle which has been hibernating in unpacked boxes since I moved has come out - it makes the living room feel much cosier when it's lit. When I checked the weather forecast earlier I was a little shocked to see it's going to get down to minus 2 degrees this week. You'll be pleased to hear that I actually managed to make a proper start on my Christmas shopping this weekend, although it was mostly things for Simon. I absolutely love shopping for him, I'd happily spend an entire day wandering around the men's departments picking out clothes for him. Love that this post has mostly been about Christmas ... damn right to!